Pleased to announce that Dancing Monkey’s short film THE VOID will be screened at the Calgary Expo Comics & Entertainment followed by a Q&A session with Melissa Tuplin and Mike Czuba. 3pm Saturday April 27th in the Quarter Horse room. THE VOID is based on Dancing Monkey Laboratories’ original performance piece, ‘Humanoid – A LOVE SUPREME’. A space that exists in another reality, where citizens are separated into the programmed or ‘The Numbers’ and the Humanoids, who are deemed empty until they are subjected to the procedure of programming. There are 34 Citizen Laws. Not everyone follows them. On February 25th to 27th, 2019, Nickel & Dime, the student run theatre company at the University of Calgary’s School of Creative and Performing Arts, produced “Like Tom Cruise Loves Running” by Mike Czuba, and they did a fantastic job. There was much laughter and so much running. An immediate, physical, Meta-Theatrical, one-act play, with 3 people, 3 chairs, much running and a struggle to answer the question: “How do you love?” Three people, actors, characters meet in a space that looks similar to a theatre stage. Grand statements are made, running on the spot, arguing, debates, agreements and declarations power this play from start to stop with a rhythm and pace that will leave everyone out of breath. AD: Lizzie Rajchel, Assistant AD: Anna S.L. Bishop. Dancing Monkey is pleased to present the third installment of Le Salon des Refusés, a staged reading of ridiculous plays and screenplays by Mike Czuba. This time out we present SHANIQUA and the SPACE QUEEN. A lost gem from the early 2000’s and missed opportunity for production companies everywhere!! But it’s not too late as no script ever truly dies. January 30th, 2019 – 8pm at KOI – 1011, 1st Street, SW, Calgary. 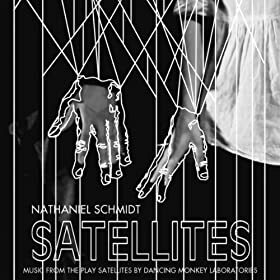 Performed by the Dancing Monkey Players: Michelle Brandenburg, Lonni Olson, Constantine X. Anastasakis, Filsan Dualeh, Wil Knoll and Melissa Tuplin (Contracts still in negotiations). The event is FREE! Bring your thirst, have a little food, and dig in those couches, sofas or chesterfields for some loose change – We’ll be passing the hat at the end. Images from previous Salons can be found HERE and HERE. Shaniqua Johnson is the lead actor in the most popular TV show on the planet. The Space Queen. A cross between the original Star Trek and Baywatch. And she hates it. But then, a rabid and obsessed fan has kidnapped her. Convinced they were meant to be together, he keeps her prisoner, locked in a soundproof apartment for his own sick satisfaction. Shaniqua has visions of the Space Queen telling her to be strong. She soon realizes that the only chance she has to save herself is to make peace with her screen persona. To survive, Shaniqua must become what she hates, the Space Queen. Dancing Monkey Laboratories is thrilled to be able to promote the haunting and beautiful music from our last production of Karl Nimeni is Not Dead – I Killed Karl Nimeni by long-time collaborators Nathaniel Schmidt and David Burnett, otherwise known as SIGNS & LETTERS. Oh Thank God You’re Here scores the surrealist and cerebral live performance of Karl Nimeni Is Not Dead and is available to stream or purchase right now! *Album artwork by Gregg Muller.